Kiger Gorge on Steens Mountain in southeastern Oregon displays a pattern sometimes seen in gorges and valleys in the Great Basin of North America – a mass of vegetation on one side of the valley, little on the other side. In the case of Kiger Gorge, the U-shaped valley runs north-south (this photograph is taken from the Kiger Outlook, looking north). The east-facing green slope should receive roughly the same amount of sun as the dry, brownish west-facing slope, but (I am guessing) the difference of when the sun shines on each slope accounts for the disparity; the slope with the western exposure will receive direct sunshine from mid-morning to early evening (after the air temperature has risen), whereas the east-facing slope starts to fall into shadow during some of the hottest hours of the day in mid-afternoon. I do have to caution that this is only an educated guess; other factors could be at play, such as microclimates caused by air movement or precipitation. View a topographic map of Kiger Gorge (click on the map on that page for a larger image) or view the terrain map via Google for some insight into this glacier-carved landscape. This photograph is from the 2007 Intermountain Expedition. Brent Hine will be sharing a presentation on this trip later this month at UBC Botanical Garden in “Explorations in the Great Basin”. Is this valley the result of erosion or glaciation? Will Brent put his presentation on the web for those of us not in the Vancouver area? You know what? I bet it might be the wind is a factor too. Also historical and/or current land use – maybe logging and/or intensive grazing by the owner of the west facing slope? For purposes of scale, the notch in the valley rim (upper center of the photo) is known as the “Big Nick”. Formed by the headwall of another glaciated valley on the opposite side, it is approximately 400 feet from top to bottom. May help to put things in perspective for people who haven’t been there. The photo reminds me of the island of Oahu. The windward side is dryer. The leeward side is greener and more lush, with more dramatic cliffs. The leeward side holds the moisture whereas the windward side loses it more rapidly. Are the prevailing winds in Oregon west to east? It’s a well known gardening fact that shade loving plants will often tolerate morning sun. Perhaps it is because afternoon sun is hotter (and drier, since the dew has long since evaporated). Another idea is that there could be less sun on many mornings due to morning fog or mist that burns off later in the morning. And this fog or mist frequently does not materialize until after the sun sets, so plants getting afternoon sun never see this extra protection. Ah, another reason that I can think off – rate of snowmelt. To answer the questions – yes, a glacially-formed valley. And I would think the prevailing winds here are almost certainly west to east. I’ve been to Steens Mountain many times. This view is one of my favorites. The notch in the east rim is visible from Burns, about 60 miles to the north. The canyon is about a mile wide at the top and about 2000 feet deep. It’s easy to find scour marks from glaciers that covered the mountain several millennia ago. I think the vegetation growth patterns have a lot to do with the availability of water. The east rim is drier because it doesn’t have as much holding capacity for snowmelt. The west rim goes back for about 15 miles and can hold considerably more water, which seeps out through the summer. There is still snow on the west rim in the photo which was probably taken in August or September. This is very nice to see as we don’t have mountains in western Massachusetts. We have the foot hils to the Berkshires and then on to Adarondics in New York State. 2000 feet from top to bottom! I don’t think I’ve seen a landscape like this. The comments on scale are much appreciated, as are the explanations for vegetation differences. 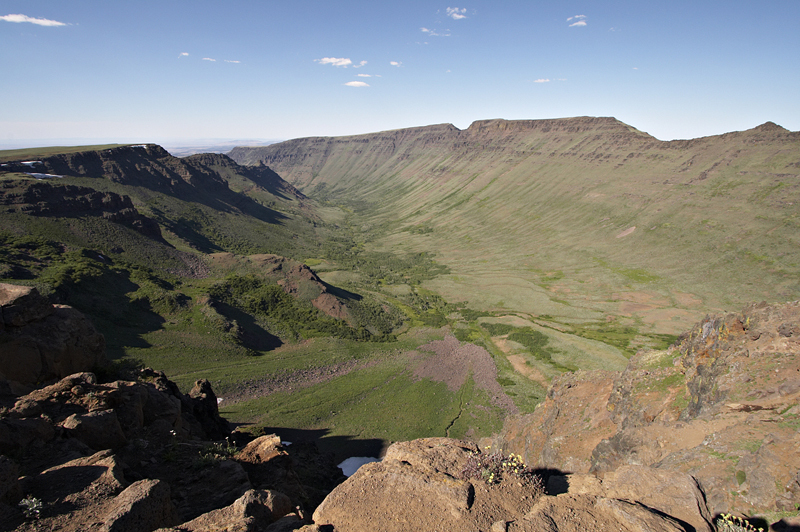 Steens Mountain is famous for the extent of glaciation from the last ice age. The U-shaped valleys are classics, and the sparse high desert vegetation lets us see the landforms clearly. A remarkable spot, and fortunately under federal protection. The Kiger Gorge is home to a wild horse herd. Its isolation has prevented much outbreeding, and experts say the horses there are closer to the original Spanish barbs than any other mustangs in North America.